Supermarket chain Sainsbury's is trialling its first "till-free" store, in which shoppers do not need to queue for a staffed or self-service checkout. Instead, customers can scan goods with a smartphone and put them straight into a bag. When they have finished shopping, their payment is processed by the phone. One industry expert suggested UK supermarkets had been inspired by a checkout-free trial store opened by online retailer Amazon in Seattle. "It fired the imagination of many supermarkets here, with not just Sainsbury's but also Tesco and the Co-op trialling various ways to achieve this," said Adam Leyland, editor of industry magazine The Grocer. 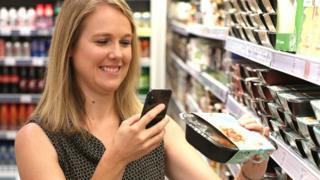 The Sainsbury's SmartShop app lets customers scan the contents of their trolley as they browse the aisles to reduce waiting time at the checkout. The app is already available in 68 stores, but customers in one location will now be able to pay with the app too. The trial is currently only available in the Clapham North Sainsbury's Local, to iPhone users who have Apple Pay set up on their device. Clodagh Moriarty, group chief digital officer for Sainsbury's, acknowledged that some customers may find the experience uncomfortable at first. But she told the BBC: "As we've been looking at customers over the past few days, the level of discomfort dissipates as more and more people do it." After finishing their shopping, customers scan a QR code by the store's exit to confirm their purchases. They are then free to leave. However, customers will still have to speak to a member of staff to remove security tags from any protected items, and at the moment alcohol cannot be purchased using the app. "There is a colleague on hand at the special point to detag any items, and you're on your way," said Ms Moriarty. "A small number of things require an added level of security - with alcohol we need to run our Think 25 [age] check, and with paracetamol there is a limit to how much you can buy. "But we will be introducing these additional items to the range, and working with customers to make sure any interventions are as seamless as possible." Ms Moriarty said the company was "aware of the risk" that some shoppers may be tempted to put items in their bag without scanning them. But she told the BBC: "When we design something like this, it is for the 99% of our customers who are honest. "When you walk around the store you will see cameras, you will see security guards and over the coming weeks, we'll be staying very close to that store." Asked how long the trial would run, Ms Moriarty said: "We're not planning on turning it off!" She told the BBC: "We're hoping to combine people and technology, to give the best service." Mr Leyland said the advent of self-scanning in supermarkets was speeding up the shopping experience. "Supermarkets are trying to take this self-service checkout process even further, by eliminating the queue for payment," he told the BBC. "They raise two key challenges, however, firstly around security, or shrinkage as it's known in the press - how to stop shoplifters. "Secondly around compliance, as certain items like alcohol and medicines have age and dosage-based restrictions."